Early in my career, I worked under concepts like Lean and growth hacking. This was long before there were books or processes documented. Instead of marketers, my team consisted of product managers, sales, software developers, and our founders. Together, we planned, launched, and grew new products and businesses. Our growth successes came from our lack of functional siloes. In this article, I’ll share 4 insights product teams can glean from collaborating with marketing early in the design process. By sharing insights and collaborating with each other, teams can get to the right solution faster. Throughout, we’ll use a fictional, financial services app our team is working on developing and marketing. You’ve likely seen this happen: marketing creates sales personas, and product design and development creates user personas. 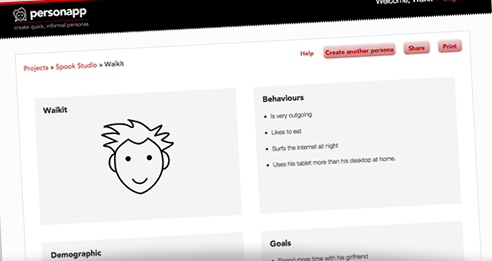 Doesn’t it seem peculiar that we’re creating personas that live independent based on function? What’s the difference between the 2, anyway? To answer that question, take a look at 2 persona development tools to see what the core elements of personas are for product and marketing. Related: Are personas ruining your product? In this case, we’ll look at PersonApp for product and MakeMyPersona for marketing. Isn’t marketing interested in functional influences? Doesn’t product and design care about the competitors a user might engage? The solution: create one, shared persona throughout the entire product’s lifecycle. Image from Brooklyn United’s Design Agency Glossary. Millennial Mike: Mike is a college grad in his late 20s. He earns around $75,000 a year, has discretional income, and would like to invest beyond his company’s 401K. His parents are not savvy investors. They saved in retirement accounts and pensions, but they cannot offer him sophisticated advice. He doesn’t know much about the stock market, but he knows he needs to do more with his money than deposit it in a savings account. He reads sites like The Motley Fool, but he often feels that the columns are above his comprehension. He recently started using his local bank’s “round up program” because it’s easy. Still, he feels like there’s more he could be doing. In many product lifecycles, marketing wouldn’t start planning until we were close to bringing the product to life. In a growth team, marketing can hit the ground running much faster. With marketing at the table from day one, marketing can start building targeting strategies for our users early. While our go-to-market teams certainly benefit, it can also unlock valuable insight for the rest of the team. From building ad strategies to competitive analysis, marketing can help product improve personas and inform user research. For organizations working with a small budget, Facebook’s ad insights can be a great place for the marketing team to start gathering data. The audience segmenting used to put together ad campaigns can provide a wealth of insights to the entire growth team. Using Millennial Mike, we end up with an audience of about 1 million Facebook users. From here we can analyze the results to see if there are other insights that our growth team might find helpful while planning and developing the product or conducting their research. From our audience data, we find some interesting data points, including media consumption and social habits. We can see the top media product. This tells us about what kind of user experience our potential users are familiar with. In this case, Tasty by Buzzfeed. Buzzfeed has a unique, specific kind of user experience. Now we know more about the experiences our target users like. What about social engagement? The audience clicks on ads (19 times in the past 30 days) but what’s more interesting is they “like” posts more often. This tells us they interact with social content. This audience is very social and engages when content has a social “hook.” If product were considering building in social features, this could be the catalyst needed. Marketing will often conduct a digital analysis. Whether disrupting a market or grabbing share, how can marketing’s competitive analysis help product? Like our audience insights exercise above, we look to uncover trends in our analysis that can inform product decisions. David Sweeney has a fantastic process documented here using Ahrefs and SimilarWeb. If your team doesn’t have the time to dive that deep into the trends, at the very least, looking at search trends can be insightful. These kinds of analysis will help uncover content users consume, sources they travel to find products, and questions users ask while looking for help in your industry or category. Marketing will leverage this to drive content strategy, but product can look to this to help craft interview questions. How does this work in reality? Let’s check in with our financial services app team. Our competitive research has indicated that not only are people looking to learn more about investing, but trends for impact investing are ramping up. As a result, we can tailor our early product development and research to find out if this is a path worth taking. In a traditional organization, product gets to work designing and developing. Maybe halfway through the process they’ll bring marketing in on some of the meetings. By the time marketing is ready to go to market, product is onto something else, maybe another team is tasked with updates, and sales is out selling. Sales now learns about objections and informs marketing, who iterates through messaging. In a growth team, everyone shares insights from day one. No matter your role and where it lies in the product lifecycle, non-siloed teams are the driving force behind high-growth products and organizations. If you can’t change you company’s org chart, start by walking across the hall to another department and getting their feedback more often or looping them in sooner. Diversity is the spice of life. We all think about data differently, but the difference is our strength. How are teams structured in your organization? Are you sharing research across your organization freely? How do you facilitate the free flow of insights across functions? Tell us on Twitter. Ryan Ruud, CEO and Founder at Lake One, a marketing and growth firm that helps startups, social enterprises, and growth driven brands find traction and drive demand without foregoing concern for people or the environment.